Simply gorgeous Montessa floor plan shows like a model! 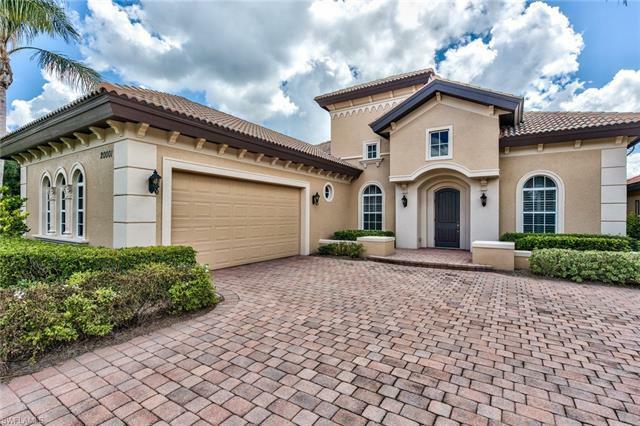 This popular great room home is spacious and open with a huge great room, coffered ceilings and large sliders and transom windows that allow the lanai space to be a part of the indoors and visa versa. Diagonal tile throughout with brand new carpet in the bedrooms. This home can either be a 3 bed + den or a 4 bedroom. Current owners are using the den as a bedroom. New AC, freshly painted inside and outside, updated frameless shower door in master, New light fixtures in kitchen, Upgraed landscaping in rear, Professionally painted kitchen cabinets, new pool pump and epoxy garage floor are some of the other recent updates. Grandezza is conveniently located in fast growing Estero surrounded by FGCU, Miromar Outlets, Germain Arena and the Publix shopping center. RSW, Coconut Point and Gulf Coast Town Center are within a 7-10 minute drive even in season!